This week in frivolous lawsuits: an emerging British brand is taking Versace to court, claiming the house stole its logo. 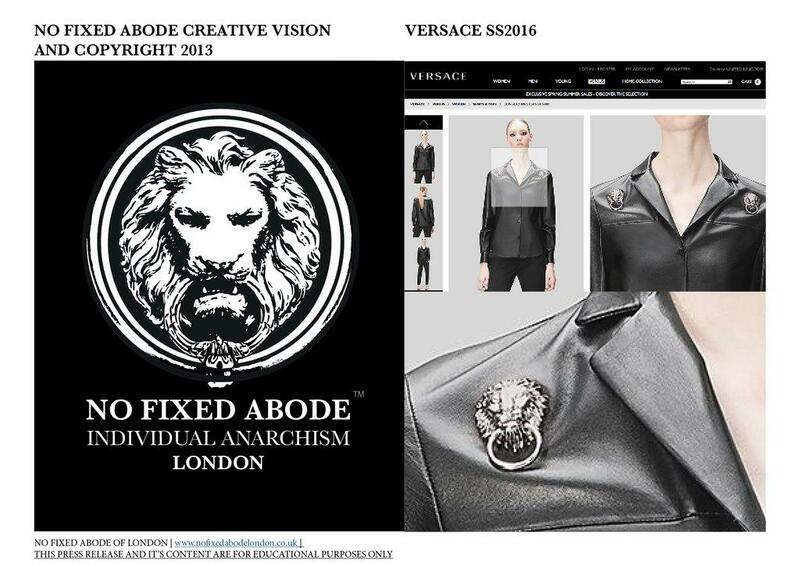 Emma Mann, founder of British label No Fixed Abode, filed a lawsuit with the British High Court of Justice’s Intellectual Property Enterprise Court stating that Versace has been using a lion door knocker emblem that looks remarkably similar to her brand logo. And despite alerting Versace to the issue last fall, the house continued using the lion motif. Mann claims she has been using the lion logo since launching her “luxury streetwear” brand in 2013. Mann also says in the lawsuit that she attempted to remedy the matter prior to her filing. 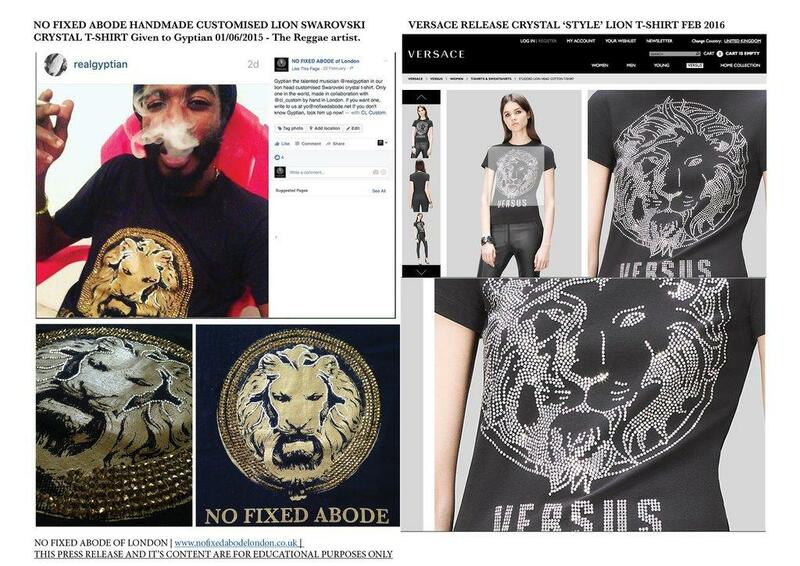 She says she had her attorneys notify Versace of No Fixed Abode’s rights to the lion marking but the issue was never resolved because of “years of Versace’s stalling tactics.” So, after receiving a trademark from the European Union Trademark Office for the lion emblem’s use on garments and accessories on January 30, 2018, Mann decided to haul Versace to court. She alleges Versace has used the insignia on over 220 products from both its main collection and its Versus Versace line. According to The Fashion Law, Mann is seeking injunctive relief, which would immediately and permanantly ban Versace from using the design, as well as monetary damages. 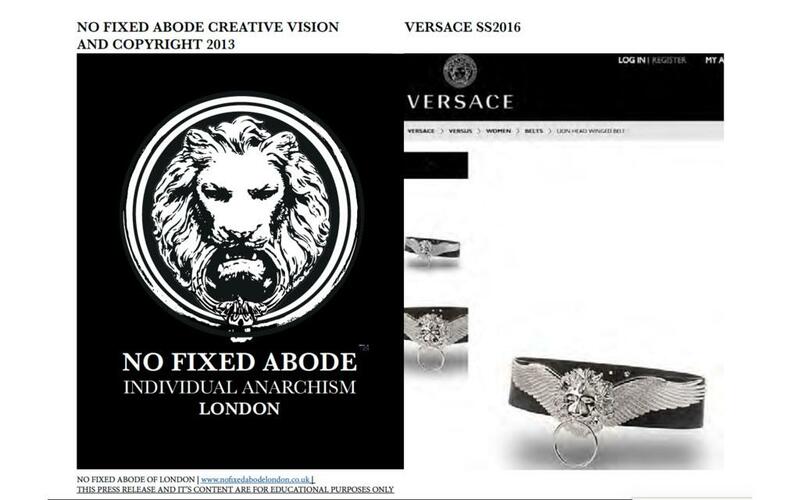 “While No Fixed Abode is highly flattered that Versace chooses to keep its brand relevant by taking direct inspiration from an urban street wear label like our own, in the interests of copyright, ideas, style, and vision it seems the boundaries between inspiration have been blurred significantly,” the paperwork states. Honestly, the whole thing just feels like a publicity stunt. After all, a lion’s head with a door knocker in its mouth isn’t exactly a fresh and original design concept. Head out to the suburbs and you’ll probably find one on every other block. Are architects and decorators stealing from No Fixed Abode too? The brand was established five years ago, but the lion’s head motif is hundreds, if not thousands, of years old. Are they going to retroactively claim credit for those iterations as well? This is actually a lot less baseless than the article makes it out to be. Just because the motif of a “lion’s head with a door knocker in its mouth isn’t exactly a fresh and original design concept” doesn’t mean that it cannot serve as a strong trademark when applied to something other than door knockers. Here’s an analogy. A bitten apple isn’t exactly a fresh and original design concept either. Yet see how long you’ll be able to make and sell phones under such logo! Versace’s lawyers probably have some good counter-arguments to the claim, but to label, No Fixed Abode’s lawsuit as frivolous right out of the gate is an overstatement.